Hi everyone and welcome to the latest in the Twisted Treeline tier list series! I was planning on updating this a few patches ago, but received an unsolicited offer from a challenger level player to help with the list...unfortunately it seems he's not up to this particular challenge, so I'll be updating it myself from now on. Highlights: It seems like Sion's taken over a lot more than just Summoner's Rift, and the new Diana buffs have brought her into new light. Check out the full scoop below! It seems for the most part higher tier teams prefer the support meta running exhaust + ignite, whereas lower divisions seem to do better with the level advantage from having a jungler. In the case of having a jungler, Cinderhulk seems to do very well on this map scaling into late game. Click to toggle champion movement history - NEW! * Melee Solo - If you're planning on getting into the upper end of the Tier 3 ladder, playing with a support is definitely the way to go at the moment. However, while you're climbing melee champions can still succeed until teams start becoming more organized and skilled with their coordination. Jarvan IV [Melee Solo God] - Despite having his armor buff nerfed, he still does well as a solo laner with his ranged waveclear and strong all-in. However, as a utility jungler he is somewhat nerfed with the removal of his armor buff, and works better as a damage dealer than a solid front line. Kalista [God Tier ADC] - With the introduction of more tanky, high CC supports such as Nautilus and Sion into the spectrum, people are finding the AD carry meta more beneficial than ever to take down tanks and kite. As the queen of such things, Kalista's become a strong champion for the marksman role when required on the rift as there's less to hold her down. Maokai [Jungle/Support God]: Maokai works in a ton of different roles and is easily one of the most contested pick in the Treeline at the moment. This of course has nothing to do with the fact that he is in fact a tree. Instead, his base damage, crowd control, and area of effect damage reduction skills are simply amazingly good on the map right now. He works best as a support, but as most of the time only higher tiers run a support, he does do well in other roles as well. Nautilus [Tier 1 Support] - Like his Summoner's Rift status, Nautilus is proving himself as a solid support on the Twisted Treeline as well with his newfound buffs in the past few patches. Shyvana [Tier 1 Jungle] - The cinderhulk change greatly benefited Shyvana, a traditionally strong 3s champion in her own right. Sion [Melee Solo God] - In his current rendition, Sion is simply a beast in terms of providing a strong front line and excellent CC. Singed [Tier 1 AP] - If your team is running a ranged AD/Support already, Singed actually works very well with his strong waveclear and frontlining abilities. However, in a team of three melee he is still somewhat lackluster. Sion [Tier 1 Support] - Similar to Nautilus and Maokai, players are finding higher damage, tanky supports to be valuable on the rift, especially when Leona is banned out. While I'm by no means a guru on the Twisted Treeline I do enjoy playing the game mode quite a bit and hope that they'll introduce the solo queue 3v3 some day. How is diana jungle in 3s? She has a gapcloser that I can assume goes over the walls, I think her clear wouldn't be bad either. Well I'd see Rek'Sai god tier in jungle. She can tunnel through almost anything, like the lane walls or the wall between base and jungle. Plus, her seismo vision allows you to avoid ambushes which is very good on a map without wards. Yay! Another tier list for us twisted treeline mains! Thanks Suntastic! "This of course has nothing to do with the fact that he is in fact a tree." wait... Maokai doesn't get tree buffs on the treeline? Next you'll be telling me Karthus doesn't get spooky spirit buffs when he captures one of the altars! Sivir is God Tier in 3's, definitely should be in place of Lucian. Yeah, actually she's the best adc in terms of KDA and Win rate on 3v3. 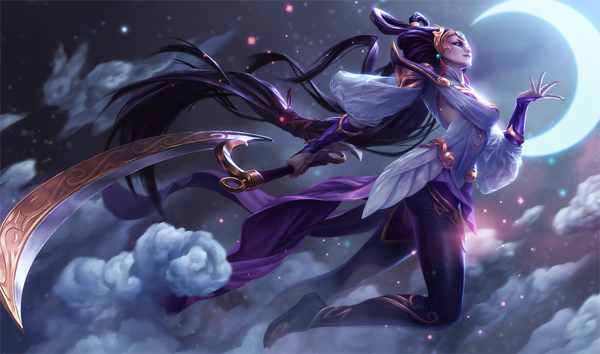 Why Diana god tier and not Ahri? What about double smite comp`s? anyone? Finally some polish changes to 3v3 on the PBE. Also, the jungle is a bit weaker now, so playing with a jungler is more viable.